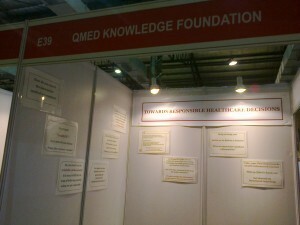 QMed participated in the Giving back – NGO India 2013 exhibition (14-15 June) a CSR initiative of UBM India at the Bombay Exhibition Centre in Goregaon, Mumbai. This was the second such exhibition by UBM India and 160+ NGOs from across the country participated in it. Apart from the stalls there were also conferences and seminars on interesting topics about running NGOs in an effective manner. This exhibition acted as a platform for us to propose the idea of conducting awareness lectures for the “non-medical people” who use the internet to search for medical information. The neatly displayed banners with catchy one-line messages attracted many visitors to our stall. Almost all of them were impressed with our area of work and “oh we did not know that something like this existed”, “this is very unique”, “this is much needed” were the most common comments we got. One gentleman after interacting with us said that ours is such a niche area of work with a scope for tremendous impact on healthcare that “Ms Vasumathi Sriganesh you should get a Bharat Ratna for this”. Were we proud, of course! The profile of visitors included corporate personnel, NGO staff and others who were enthusiasts out to explore the work of the NGO sector. Rain did try to play a damper but did not quite succeed in keeping away the visitors. The novelty of someone teaching them to “search the internet” coupled with a caution they need to exercise to search medical information convinced almost all the visitors the need for this and most of them have agreed to invite us to their offices, housing societies etc to conduct such awareness lectures. We were happy to receive an overwhelmingly positive response to this initiative of ours. Having sensitized health science professionals in searching medical literature correctly which will eventually translate to better patient care, we now plan to reach across to the non-medical audience to sensitize them about searching the internet correctly for medical information. This will bridge the information divide between the doctors and the patients by enabling the patients to seek correct information and participate responsibly in the treatment process. Thank you UBM India and Guidestar India for providing this platform to showcase our work. This entry was posted in 6 - Old posts and tagged Information Literacy, Informed healthcare decisions, Internet Searching, Medical information, NGO India 2013 Exhibition, Patient Awareness, QMed's Learning Investments. Bookmark the permalink.